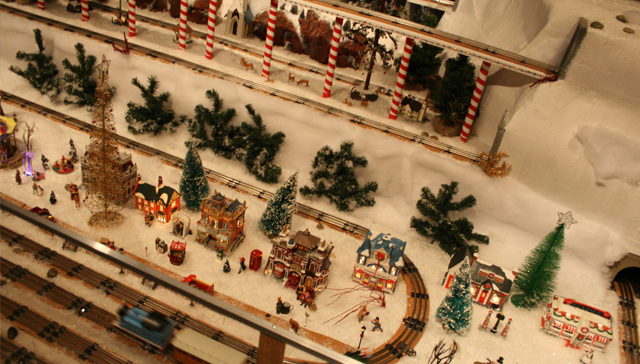 I am guessing that train sets are still one of the most popular requests Father Christmas receives every year. I have compiled a list to help his elves find the right one for their toddler. Toot toot! 1. 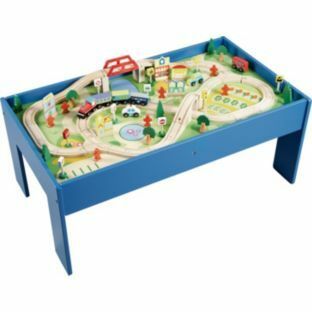 This Big City Wooden Rail Train Table from ELC is a real investment at £100 but it is a fabulous stand alone set for ages 3+. 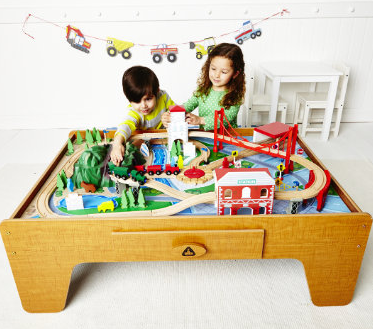 The table means that your child’s train world can be in it’s own space rather than spread all over the floor. The set comes with over 100 accessories, a built-in storage drawer and a reversible play mat. 2. The Large Wooden Train Track Set from GLTC is also for kids age 3+. The 43 piece set can be matched with other GLTC kits such as Farm and Toy World meaning that your child can grow their set environment over time. £30. 3. This Brio My First Railway at John Lewis is an ideal ‘first’ train set aimed at children aged 3+. 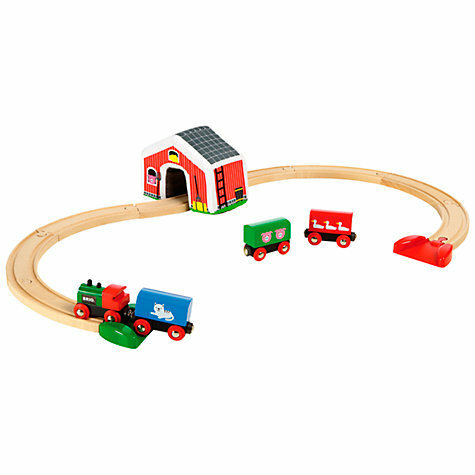 This simple set includes track and a brightly coloured set with wagons. Perfect for developing motor skills and spatial awareness as toddlers manoeuvre the train through a tunnel. £24.99. 4. 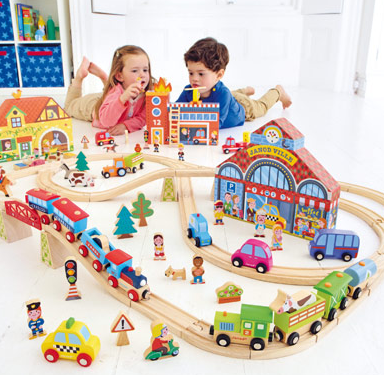 Asda’s Wooden Train set is a bargain at £13. The kit comes with 60 pieces in nice gender neutral colours. 5. Chad Valley offer this Wooden Table and 90 Piece Set for £39.99 at Argos. 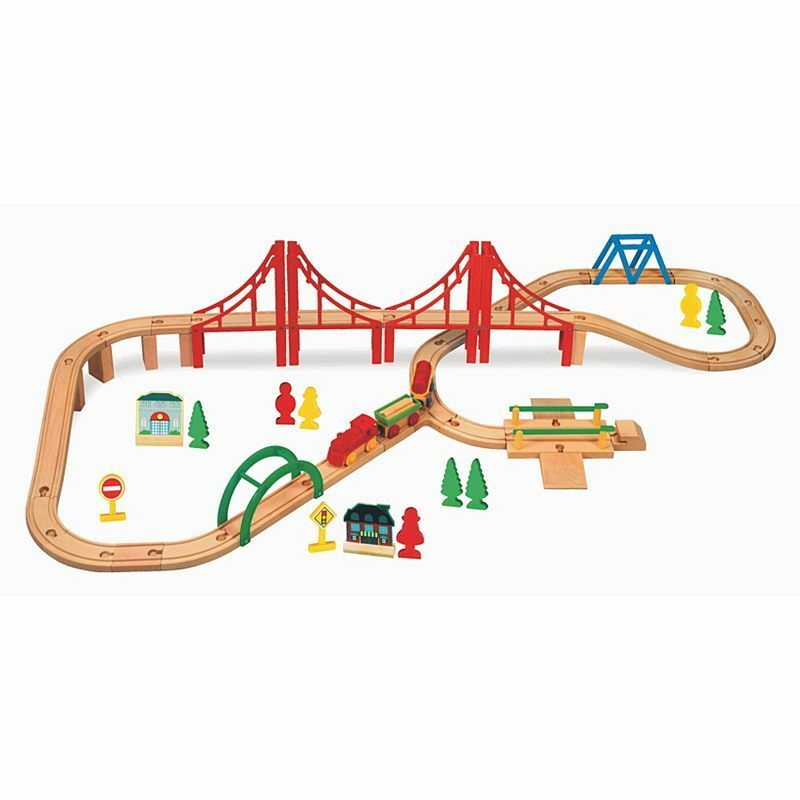 The 90 piece set includes includes 4 wooden trains, road signs, trees and bushes, buildings and track. Does your toddler like trains? Which ones do you recommend?